Clock ticking and need a game to run? 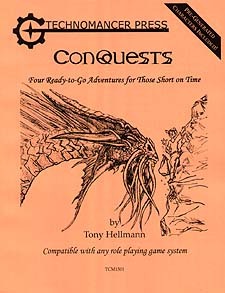 ConQuests is four convention-style scenarios - complete with adventure, maps, handouts, and pre-generated characters. If you have 3 people, a couple of hours, and this book - you're ready to RPG! Each scenario stands alone and is perfect for a last-minute session, or when only some of your players show up one night, or even if you find a clear table over lunch. Be ready to game at any time!